We are pleased to offer for sale these Paper Record Sleeves for 33 RPM Albums by BCW! This listing is for a Pack of 50 Sleeves with Round Corners and a Center-Cut Hole. 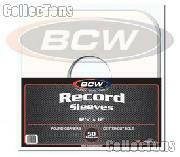 The BCW 33/13 Paper Record Sleeves are pure white, archival quality product. Use with your own LP Jackets or our BCW Paper Record Jacket.